Front Row Centre Events is excited to present another season of spectacular dance performances! This season features productions from The Bolshoi Ballet and The Royal Ballet. The FRCE Dance Series offers Canadians the opportunity to see world-class ballet at their nearby theatre! Kenneth MacMillan’s famous version of Shakespeare’s romantic tragedy set to Prokofiev’s magnificent score returns to open the 2015/16 Royal Opera House Live Cinema Season. 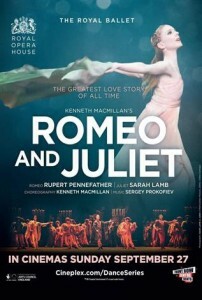 This Romeo and Juliet is rich in the swaggering colour of Verona street life and in sword fights and celebrations, but MacMillan’s focus is always on the complex emotions of the young lovers – especially on Juliet as she journeys through the delirious happiness of first love to a shocked, adult perception of her fate. Juliet is one of the most coveted of all ballerina roles, and as MacMillan’s ballet enters its 50th year it resonates as deeply with audiences today as when it was first seen half a century ago.